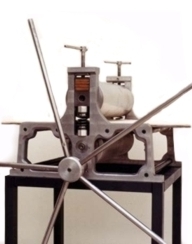 Renda has the pleasure of presenting you a new model of etching presses conceived from the exigency and passion of the artist, taking great care of the technical aspects and the form, without altering the artistic value that this technique has had along the centuries. Easily pliable to allow rapid movement. The angle is adjustable to fit any position. The shelf is adjustable in height. Height 1.70 m. Base width 76 cm. Suitable for canvas of maximum height 130 cm. This easel box has the vertical section built into the lid so that the easel can be easily adjusted. 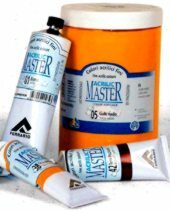 For watercolor painting for instance we suggest the flat position, for drawing a slight angle, for oil and acrilic painting a vertical position and for pastel painting it must be slightly inclined forward. The rounded corners of the box guarantee a good protection of the box. Sketch box with 5 sections. Complete with handle and rubber feet to protect the table. External size 43x33x10 cm. Maximum height of canvas 70 cm. 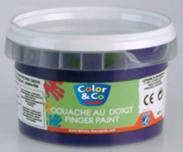 Used for fixing canvas to stretchers. Length of the jaws 60 mm. A spring opens the jaws. Attention! Will break if dropped. Plane diameter: 30 cm. Weight: 46 Kg. Packing size: 55 x 55 x 88 cm. 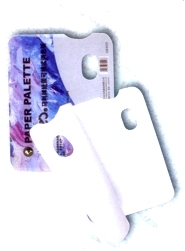 Rectangular painting palette, composed of 40 sheets of size 21x29,7 cm and a cardboard at the end of the sheets. The advantage is that you do not need to clean the palette but you just throw away the paper sheet. Oval thumb-hole. Size: 25 x 31,5 x 17 H cm. Weight: 8,5 kg. Width of roller: 25,5 cm. Diam. lower roller: 3,5 cm. Diam. upper roller: 3,5 cm. Metal plate: 26,8 x 42 x 0,3 cm. Single Packing: 46 x 31 x 20 cm. Colours: yellow, red, green, brillant orange, blue, white. 24 colouring pencils, 24 oil pastels, 12 paint discs, 2 brushes, 2 sketching pencils, pencil sharpener, eraser, sand-paper, mixing palette. Heating Plate with a thermostat that regulates the temperature from 15° to max. 110°. The heating surface made of anodized aluminum and 4 mm thickness, insures a high thermal stability and the advantage of an energetic saving for a constantly heated surface.